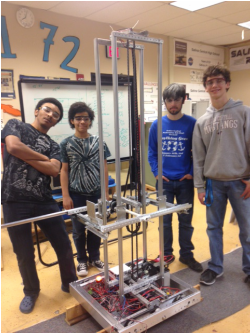 ﻿FRC Team 3172 is a robotics team based out of Salina, Kansas. Ambitions and expectations are high during the whole season as we prepare for regional competition. A passion for science and technology drives our team. Sportsmanship with cooperation in competition, is our main objective. All of us on the team have interests in some aspect of the FIRST Robotics competition. We continue to function exceptionally well as a team. Over the years, Team 3172 has won the Website Award at the Colorado Regional, the Chairman's award, and the Rookie All Star award.